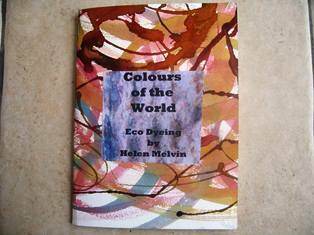 In an earlier post I wrote about some of Helen Melvin’s booklets on different aspects of natural dyeing and I was delighted to notice that she has added another title to her list. This latest one, “Colours of the World – Eco Dyeing”, deals with mordanting and dyeing using methods which include cool mordanting, solar dyeing, patterning with rust, water bath dyeing and fermentation dyeing. As usual, Helen offers some interesting ideas for experiments and writes in a way which is sure to leave dyers keen to embark on colour discoveries. The photos of the dyed materials add to the impact of the book, which should be of interest to both new and experienced dyers. It has certainly inspired me to experiment with some of her methods. This is Helen’s new booklet which, like all her others, has a beautiful hand-painted cover. For more details and to purchase a copy, click on the link to Fiery Felts, under the heading “Useful Websites”.